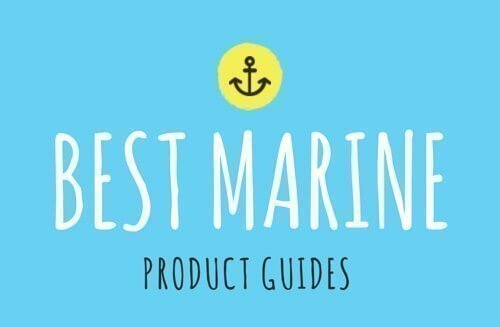 If you are looking for an efficient floating marine radio that includes a 66-channel WAAS GPS receiver and ability to transmit and receive distress calls? Look no further; the Standard Horizon HX870 VHF Marine Radio does this and much more. Built with its own powerful GPS/DSC receiver, buoyant die-cast chassis, and submersible waterproof construction, rest assured that you’ll effortlessly navigate the water like a true captain. The Standard Horizon HX870 is the successor of the popular HX851 portable marine radio. Up until now, the HX870 remains one of the best handheld marine radios on the market today. The premium features tough construction waterproof design are just a couple of the reasons it is our favorite handheld radio. The HX870 works with all US, international and Canadian marine radio channels and has a dedicated receiver for CH70 (DSC calling). During the set up, you are are able to choose your group setting - US, Canada or international. To activate distress function, hold DISTRESS key for 3 seconds. A special signal will be sent to all nearby vessels in a range of 5 miles. Make sure to register for MMSI number and set it up on your HX870 handheld radio. DSC signal with your coordinates will NOT work if you don't complete this step. The VHF marine radio is one of the best models which include an easy to operate menu system perfect for non-tech savvy mariners and crewmen. The Standard Horizon HX870 comes with a 6 Watt VHF radio with a 2.3-inch screen size twice as large as its competitors. Focusing on intuitive and efficient design, its operating buttons are all positioned strategically near the screen for ease of use. It’s also waterproof and floats, a helpful feature should you drop it in the water. In event of any emergency or terrible weather condition, the Standard HX870 ensures that you can contact the coast guard or other boaters. It uses noise-canceling microphone technology that enables clear outgoing and incoming calls so you can send and receive clear messages without disrupting noises from your ship’s engine or the water. With its built-in class DSC, you can simply push the distress button in order to send a message to the coast guard and other vessels nearby. It can save as many as 200 waypoints and 20 routes using its own compass page which shows COG, SOG, bearing, and distance to individual waypoints. With its unique and high tech compass page, you can see up to nine vessels in range! The high capacity 1800 mAh Li-Ion battery with a 3 hour quick charge function will provide plenty of battery life for regular use. You can also use supplied alkaline battery tray that takes 5 AAA batteries. The HX870 has the ability to receive weather alerts and has an assigned WX soft key to get current weather information. The biggest advantage of this portable VHF radio vs other VHR radios is built in 66 channel GPS receiver. The internal GPS antenna allows this radio to display your position either in a compass or numerical style. You can log your GPS location at regular intervals using the LOGGER function. The HX870 also allows you to share your GPS position and request GPS positions from other vessels. So what else makes this a top notch VHF radio? Built in navigation! You can store up to 200 waypoints on the HX870. Go to menu > NAVI> WAYPOINT and you will get access to your history, memory or manual entering of coordinates. The large display will show the compass with the coordinates of your final destination. 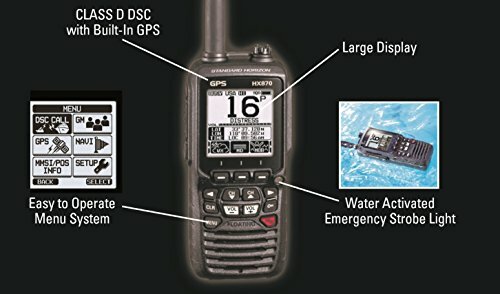 This is extremely useful especially for smaller boats or kayaks where the space is limited and you want the radio to do it all. If you ever end up overboard, the HX870 has a few things to help you in emergency situations. First of all, this is a floating radio that is IPX8 rated (30 minutes under 4.92ft of water). It also has water activated SOS strobe light. If the radio is dropped, it will turn on (even if it was powered off before) and start flashing an SOS light. MOB function (Man )ver-Board) will memorize the position information instantly if the radio is dropped into water. Dimensions: W 2.44" x H 5.43" x D 1.69"
If you are looking for a reliable, fully featured handheld marine radio, look no further! The Standard Horizon HX870 is one of the best portable VHF radios on the market today!